Last month, 17 high school students from the Natural Science and Technology Center, a Toledo Public Schools Career Tech Program, came to the Chemical Engineering Unit-Ops Laboratory in Nitschke Hall to learn about water quality and purification systems. 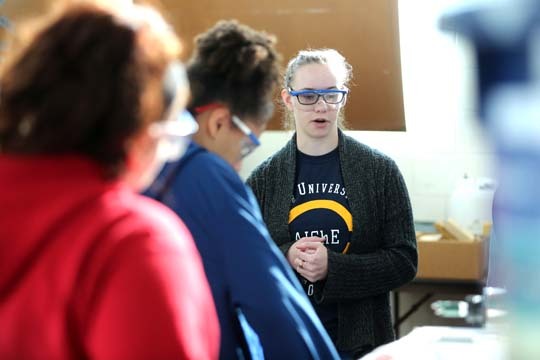 Megan Davidson, a second-year chemical engineering student, taught the students about the engineering aspects of different water purification systems to get them started in thinking about how they can use both water and energy in a more responsible way. Megan Davidson explained how a water purification system worked to local high school students who recently visited campus. Davidson has been a strong advocate for water purification since starting at UT. Her interest was initially piqued when she went to Guatemala in 2015 to build a home for a family in need. In her freshman orientation class, Davidson had the opportunity to learn about the ultraviolet water purification system made by Clean Water for the World and was surprised by the simplicity of the system. She then became involved with Walk for Water, an organization that raises money for water purification units and spreads awareness of the conditions of the water in developing countries. This year, Davidson served as the educational outreach director for Walk for Water; she helped develop a lesson plan for seventh- and eighth-grade presentations, which covered a wide range of related topics. During spring break this year, Davidson was invited to go to El Salvador with a group of chemical and environmental engineering students to visit various communities and assess their water situation. They surveyed people’s overall health and their use of and accessibility to clean water. If the community did not have a water purification unit, the UT students installed one of nine units they had brought and taught the people how it works and how to clean and replace parts as needed. For the communities that already had a unit, they recorded the maintenance of the system and took a list of needed parts to keep it operational. Davidson is passionate about water purification projects and plans to stay involved with them in the future. She is considering spending time in Central America to address water problems after she graduates. This entry was posted on Thursday, May 4th, 2017 at 3:54 am and is filed under Engineering, Features, UToday .